The outlets work together on this 7 outlet power strip, automatically switching devices on and off, saving you money on your electric bills. Two of the outlets always have power, allowing you to plug in devices that should never turn off (1 is transformer-spaced). One of the other 5 outlets is the master outlet, controlling the other 4 outlets. Those 4 outlets automatically turn off whenever a 10%+ drop in current to the master outlet is detected and automatically turn on when an increase of 7 watts or more in power to the master outlet is detected. In other words, plug your computer into the master outlet and its peripherals into any of the other 4. When you shut down your computer all of the peripherals will also turn off. When you turn on your computer the peripherals will also turn on. 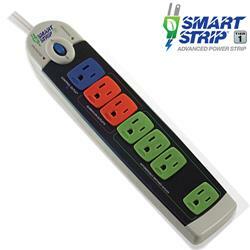 The Smart Strip has a lighted power switch, is wall mountable and 2 RC filters to help prevent false switching. The 4 foot long power cord is a heavy-duty power cord. It uses 1 watt of electricity when fully energized and 0 watts when the switched outlets are off.